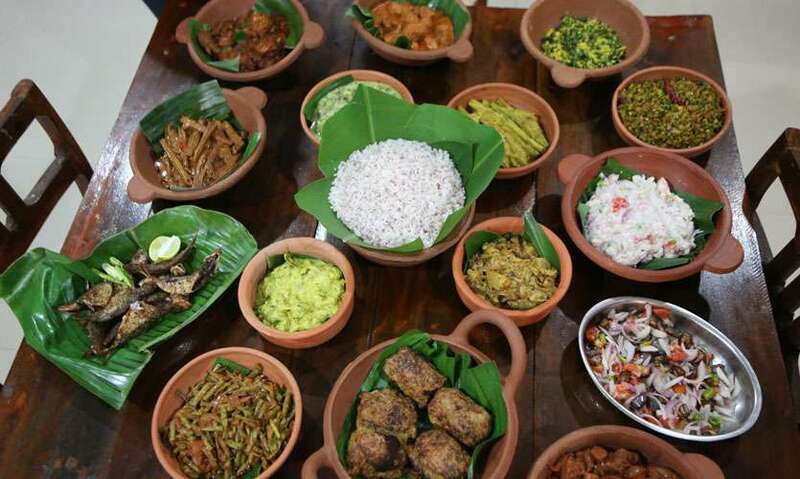 The long dining table at the home of My Sister's Kitchen (MSK) is struggling to find room for the rest of the dishes for our lunch and our plates covered with banana leaves had long since run out of space for the curries. 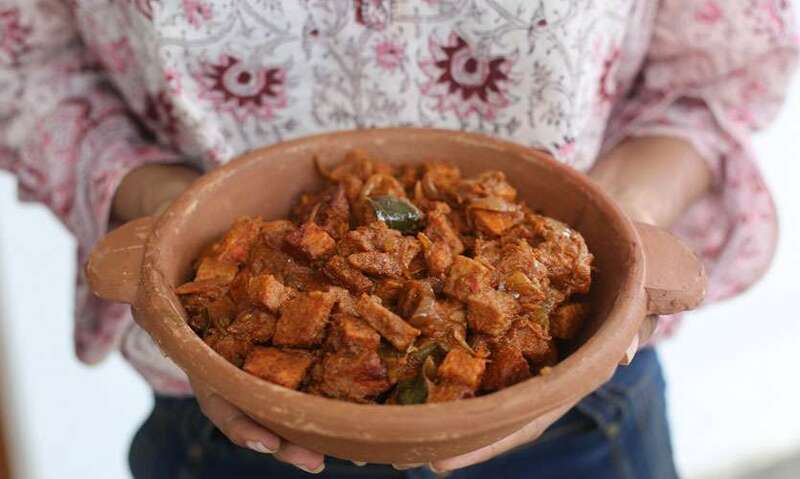 says Thushara Innasithamby as she effortlessly gets about finishing the last dish for our lunch; a spicy thick prawn curry of which the aroma had wafted from the kitchen to our table leaving us more than ready to dig into our rice and curry. Hailing from a background in banking, today Thushara is a full-time home cook running MSK and catering to families and both small and large-scale events. While MSK’s menu includes a wide variety of foods, her specialty is Jaffna cuisine made with family recipes passed down for generations. Having visited her hometown Chillala last year, Thushara returned with a few new recipes to revamp her menu. She recently had us over for lunch and we got to try out not just her new introductions but also a few old favorites as well! With over 16 dishes to taste, here’s our take on MSK’s home cooking! We started with their Vegetable Curries. There were 2 varieties of Murunga; Murunga Red Curry and Murunga White Curry. 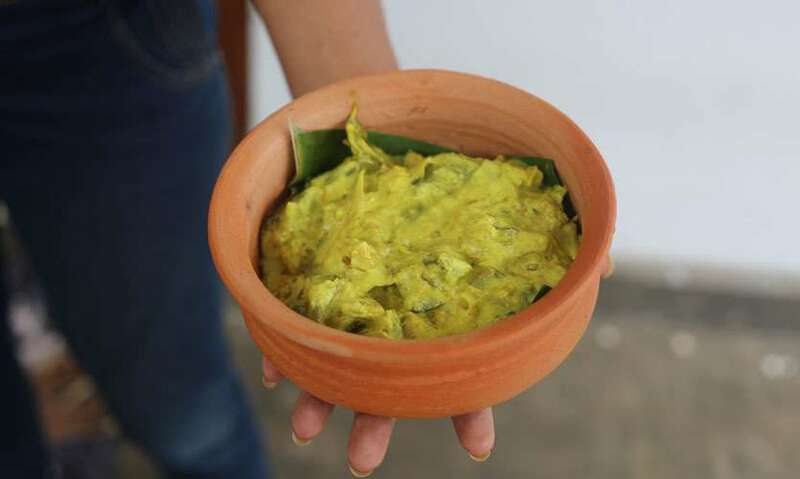 It’s a classic Jaffna Staple and the White Curry, made with garlic, onion paste and egg, is one that we have tried and tested before and loved. However, the Red Curry was something new and it completely blew us away! Made with unroasted chili powder and tamarind curry powder, the flavours of the Red Curry were sharp, tangy and delicious and is a dish you can even eat by itself. Next was the Tempered Alu Puhul (Winter Melon) with sliced onions, garlic, mustard seeds and a spot of curry powder to taste. Soft and mushy, this dish is a great alternative to the usual tempered potato. 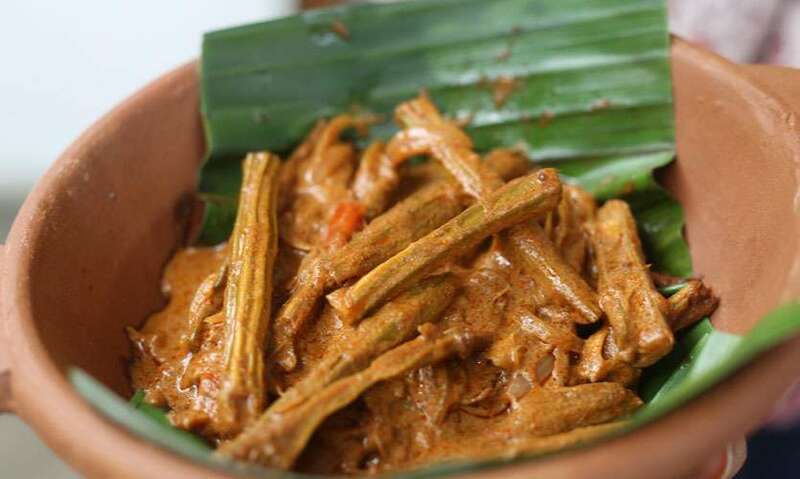 The Thampala Curry was something we’ve never tried before. 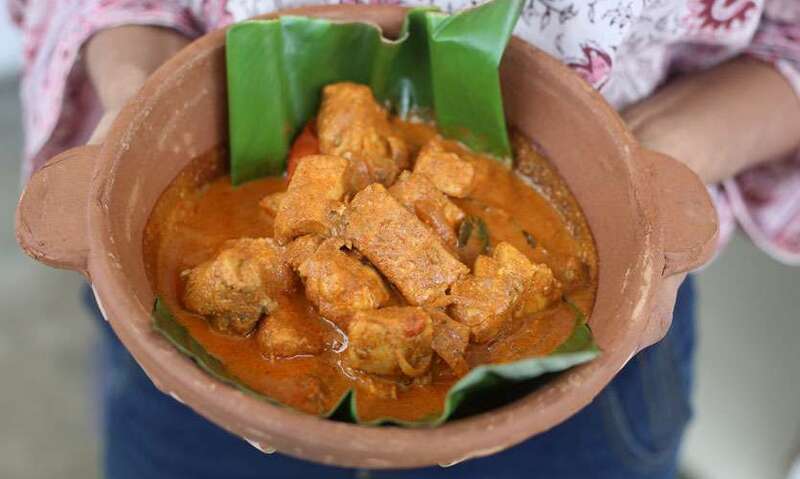 The slight bitterness of the Thampala leaves was offset by the creamy texture of the white curry. 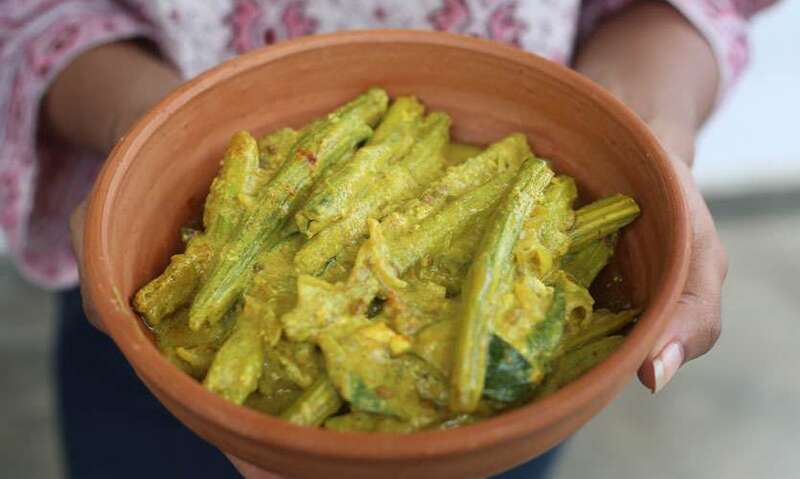 The another mellowed out curry with plenty of flavours that we enjoyed was the Brinjal White Curry and the Long Beans cooked in a thick paste of garlic, onion and curry powder completed the vegetable dishes. 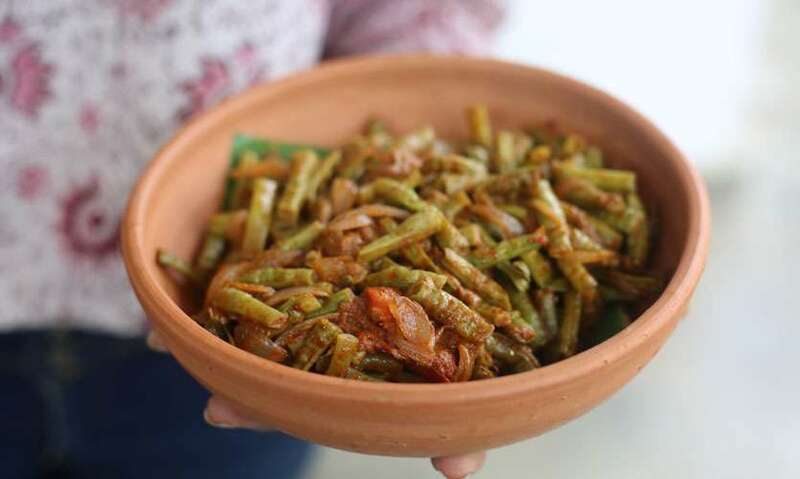 However, no Sri Lankan meal is complete without greens and we certainly had a number of greens on our table like the Murunga Leaf Mallum and Onion Flower Stir Fry. 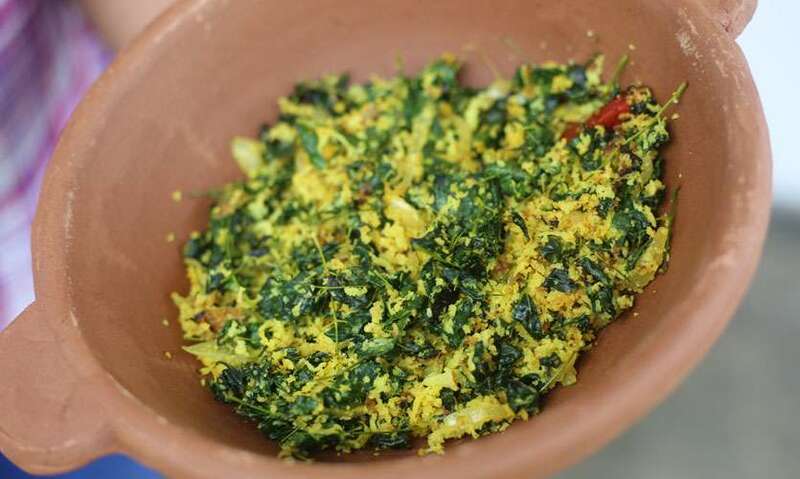 The Murunga Leaf Mallum, made with grated coconut, red chili, and turmeric, was vibrant in colour and texture while MSK’s Onion Flower Stir Fry brought a burst of freshness to the palate- it evoked the taste of the spring onions more commonly used in everyday cuisine but introduced a new almost umami-like vibe to the dish. One dish from the new menu was the Ash Plantain Sambol made with coconut milk. 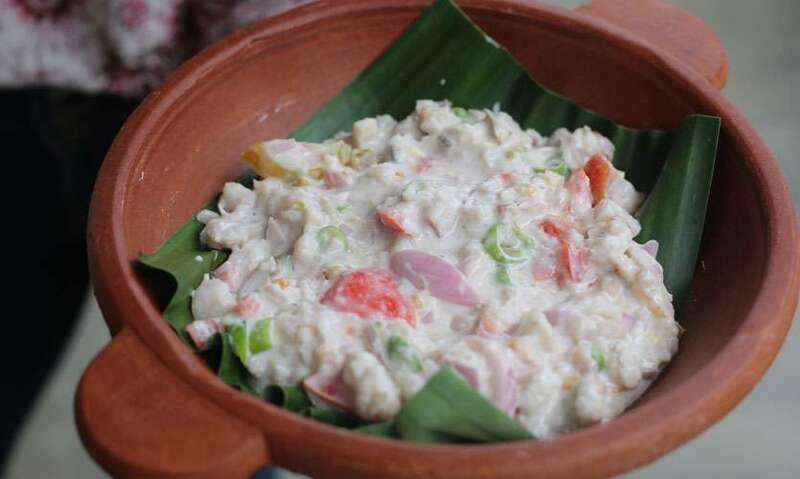 Boiled and mashed, the ash plantain is mixed with a thick coconut milk and tossed with onions, tomatoes and green chili. 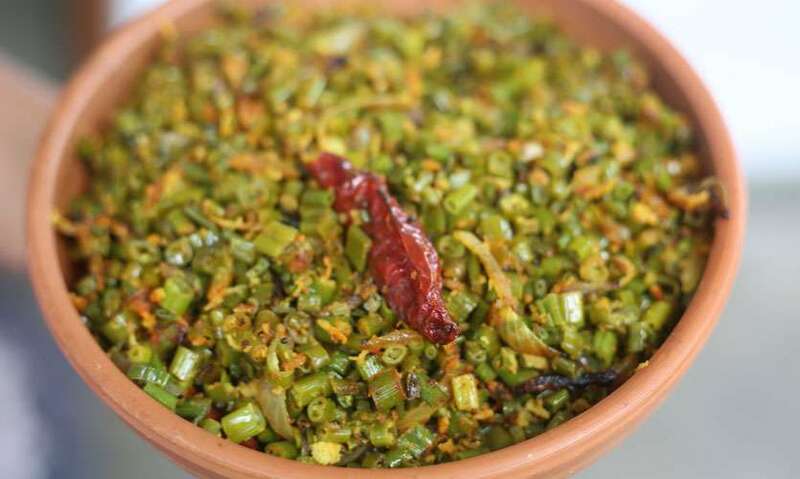 While it bears a stark resemblance to a ‘raitha’, the Ash Plantain Sambol has a unique taste of its own that we preferred over the former. Another dish that was introduced was the Taro Root Curry. Small cubes of Taro Root are deep fried and cooked in a mix of spices until a thick curry is formed. With its perfect balance of spice and flavour, this dish is a perfect substitute for a meat curry. 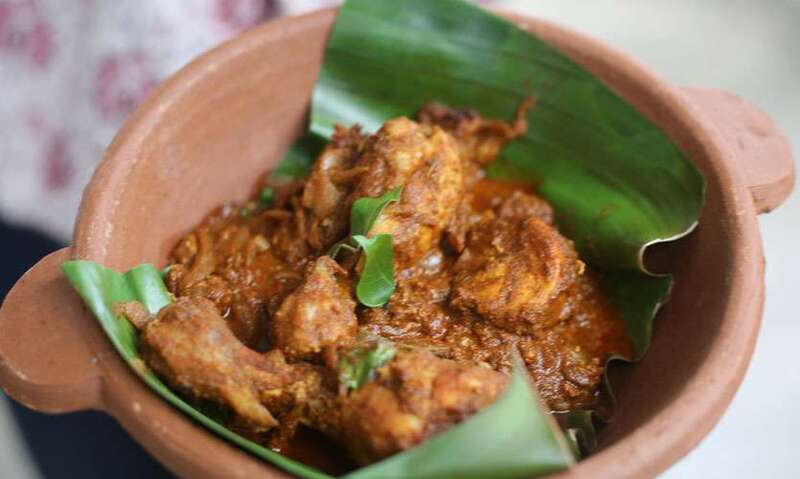 We also had their Chicken Curry and Fish Curry which incorporated tamarind as a souring agent and allowed the other spices to come through beautifully, giving them a rich, deep flavour. 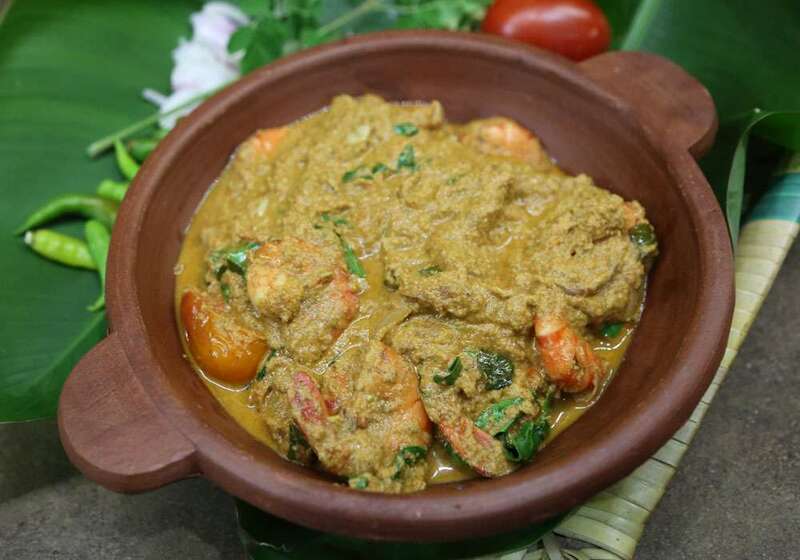 New on her menu is the Village Style Prawn Curry. A thick curry made with a spice puree, the taste of this dish really lived up to its aroma. Whether you are having it with rice or even a hot roast kade paan, this prawn curry was a dish we couldn’t get enough of. Of course, no rice and curry is truly complete without a crunchy element and MSK certainly didn’t disappoint. 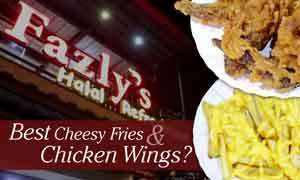 Her new menu includes ‘Prawn Stuffed Battered Karawila’ which we couldn’t have enough of! 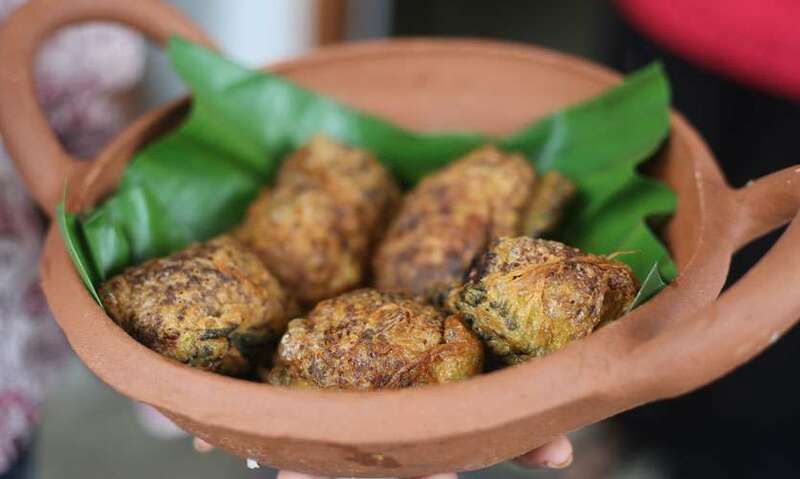 Large chunks of hollowed out Karawila is filled with a spicy prawn stuffing and deep fried to crisp perfection. 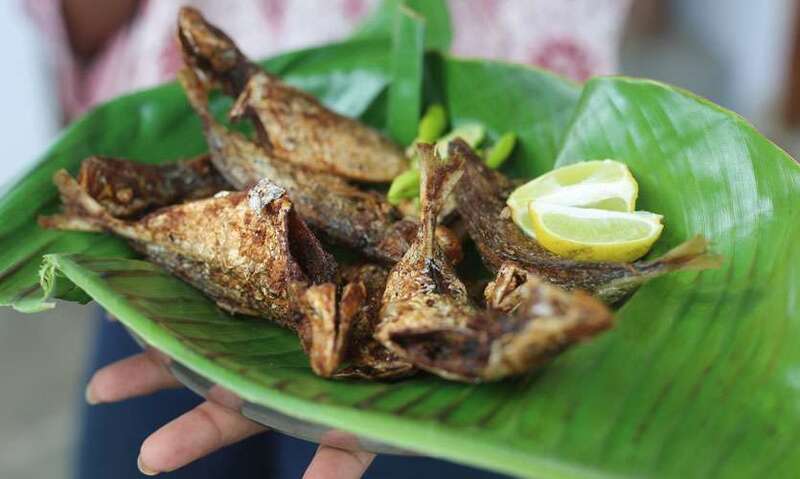 Fried fish with rock salt was also served because as Thushara says, ‘a crunchy element or two is a must have at the table in Jaffna’. Wrapping up our meal, we had a unique dessert. 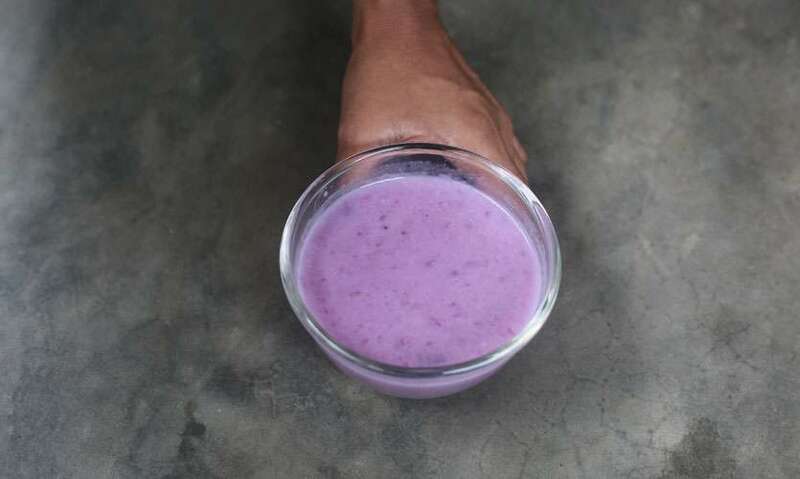 The Purple Yam Porridge is also a new addition; it’s a sweet dessert made with just four ingredients; purple yam, coconut milk, sugar and salt and is served warm for best taste. We couldn’t remember when we last had such a satisfying lunch! 16 dishes was no simple feast but was one we happily enjoyed thanks to the stunning blend of spice and flavours by MSK. Whether you are looking for good Jaffna cuisine or even just a simple pasta or lasagna, you are in good hands with MSK. 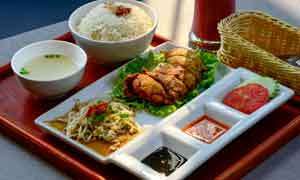 While Thushara may not be a trained chef, she has perfected the art of creating good food made with passion. As we mentioned in our previous review, eating from MSK is like eating home cooked food and we know that there is nothing more delicious than food from home! Delivery available. Requires 24 hour notice for orders.